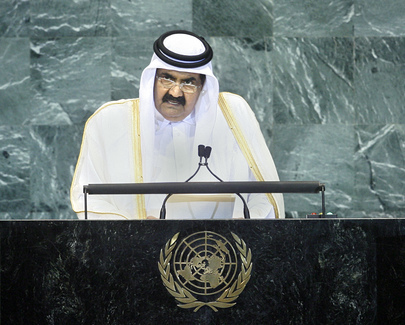 HAMAD BIN KHALIFA AL-THANI, Emir of Qatar, reminded the Assembly that the threats that beset the world last year were not only still present, but had “increased and diversified”. And the world was not any closer to achieving the Millennium Goals. The problems the world faced were not due to a lack of resources, he said, but to mismanagement and a lack of justice and equality. Therefore, it was time to “reformulate” the global economic system to achieve justice and equal opportunity for all. He called on delegates to discuss and adopt those appropriate, the proposals posed at the World Economic Forum Global Redesign Summit - hosted in Doha – to improve the international structures and partnerships that would help meet the century’s challenges. Also, the Middle East continued to experience the highest degree of tension in the world; the decades-old question of Palestine, unstable situations in Somalia, Afghanistan and Iraq, and Iran nuclear crisis, required a solution. His Government had stressed the importance of reaching a solution through peaceful means and, in its view, a fruitful, direct dialogue between the United States and Iran would contribute to a resolution of the crisis. He said the Arabian Gulf’s geo-strategic position – it sits on half of the world’s oil and gas reserves, and is the source of one quarter of the world’s production of the two driving forces of the global economy — should remind the international community of the importance of political security in the Middle East. That goal could only be achieved, however, by renouncing the use of force, freeing the region of weapons of mass destruction, and settling of bilateral disputes on the basis of international agreements. Regarding Palestine, he said that Israel’s “persistent violation of international and humanitarian values was reflected in the acts of piracy committed against peace activists who tried to break the unjust siege imposed on the Palestinian people in the Gaza Strip. He called for the international community to demand that Israel lift the blockade “immediately and fully”. A lasting acceptable peace agreement on the question of Palestine would “guarantee the rights of the Palestinian people, particularly the establishment of Palestinian state with Jerusalem as its capital”. Turning to terrorism, he emphasized two important issues of concern. First, the attribution of “this so-called terrorism” to the Islamic religion, he said, was incorrect and unjust. Violent actions that had occurred in the United States, Europe and Asia were attributed to underlying political, economic, and ideological ideals - not to a particular region, country or idea. Further, the term “war on terror” had plunged the region into a war “with no limits, end, logic, nor legal or moral conditions”. Second, he said terrorism should not be treated by waging wars. Contrary to achieving security, peace or security, that method had spread destruction, killed and displaced millions and undermined efforts for dialogue among cultures. At the national level, Qatar would pursue “human-centred” development policies based on a holistic approach. The country had made concrete steps in enhancing its development capacity, particularly in the areas of health and education. It was also striving to utilize its abundance of hydrocarbon fuel reserves, in the service of its citizens and to improve human development indicators. Because it was also keen on addressing climate change, clean energy, particularly natural gas, was a priority. In closing, Qatar reaffirmed its commitment to play its part in the collective responsibility “as expressed in the Charter for the common good”.